Large Papier Mache Tree Ornaments from India (pair), "Holiday Festival"
Intricate patterns in holiday colors invite Kashmir-style cheer into your home this Christmas. The set of 2 large papier mache ornaments are painted by hand in black, gold, red, sapphire, ivory and green by India's Sajad. They hang from golden cords. Each (2): 12 cm Diam. 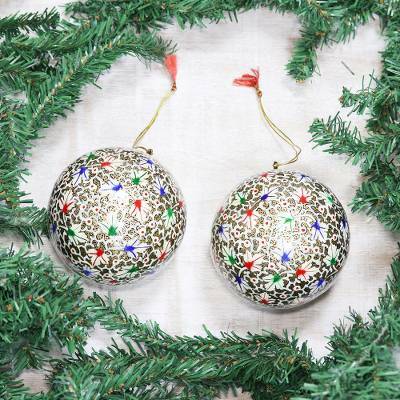 You can find large papier mache ornaments 'Holiday Festival' (pair) by Sajad in holiday decor & ornaments categories such as Christmas Ornaments and Hand Painted Ornaments. Enjoy exploring these sections for other Novica treasures.